Think of a podcast as radio on demand. Podcasts are free, radio-like talk and music shows. Podcasts allow listeners to choose what type of show or information they want to listen to and when they want to listen to it. Apps for smartphones and portable media players allow listeners to subscribe to podcasts they like and download each new episode as it becomes available. 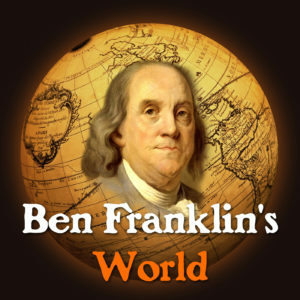 Ben Franklin’s World: A Podcast About Early American History is a show for people who love history and for those who want to know more about the people and events that have impacted and shaped our present-day world. The show caters to an audience of non-specialist history enthusiasts. Ben Franklin's World explores early American history in its broadest sense. It investigates the events and peoples in Europe, Africa, the Caribbean, and South America that affected the way North Americans lived, dressed, worshipped, conducted business, and exercised diplomacy. Podcasts generate awareness. Your appearance on Ben Franklin's World will allow us to create an informed public. Not only with this public come to know more about you and your narrative or historic site, but your appearance will help them become more aware about the people and events that have helped to shape our present-day world. Appearing on Ben Franklin’s World will help generate interest in your historical research and spread the word about it. You and I will schedule time to conduct a 60–minute interview. Our interview will be a conversation that will allow listeners to learn more about you and your historical work. A few days before our interview, I will send you an e-mail containing the biographical information I plan to use to introduce you and the questions that I plan to ask during our interview. This e-mail will provide you with the opportunity to prepare your points. Depending on the course of our conversation, we may not have the opportunity to discuss all of the questions I presented to you. Additionally, as a conversation, I may depart from my question sheet to ask follow-up questions based on information you share. Before we begin our formal interview, we will start with a bit of informational chitchat so that we can both get used to each other and so I can check your audio output levels. If would like to discuss your book on Ben Franklin's World, I will need you to send me a review copy so I can prepare for our interview. I will send you my mailing address when we schedule your interview.